Vivid color is one of the hallmarks of the finest colored gemstones. Indeed, we use gemstone names to refer to especially intense colors wherever they might be found -- sapphire blue, ruby red and emerald green. Ruby, sapphire and emerald have been treasured for centuries because of their vivid colors. But some recent discoveries rival these traditional stones for intense color, especially the violet blue of tanzanite, the chrome green of tsavorite garnet, the pink-red of Mahenge spinel and the neon green-blue of paraiba tourmaline. In fact tsavorite garnet has begun to challenge emerald as the finest of the green gemstones. Tsavorite is a more brilliant and fiery gem, with color saturation that can be matched by only the finest emeralds. Where emerald tends to have a sleepy look, due to its lower refractive index and numerous inclusions, fine tsavorite is relatively clean and transparent with twice the dispersion of emerald. Unlike emerald, tsavorite is always completely natural and untreated. Because of its many surface-reaching inclusions, emerald is almost always fracture-filled with oil or resins. Tsavorite's only weakness compared to emerald is that the finest emeralds have color that is so intense that it really pops. Tsavorite's deeper tone and saturation displays a richer but less exuberant hue. However, there are certain rare tsavorite garnets that combine a medium tone with an intense saturation. Some of these so-called Mint Garnets are so remarkably vivid that they are as striking as any emerald. Mint garnets are typically a slightly bluish-green with a light to medium tone. Most are pastel in color and are attractive but not especially exciting. Very occasionally we find a superlative specimen that displays exceptional saturation and amazing brilliance. We recently acquired a superb 6.16 ct Mint Garnet from Kenya to add to our collection, which also includes several other very fine Mint Garnets over 4 carats. These are exceptionally rare gems that will please the most discriminating collector. An outstanding paraiba tourmaline from Mozambique with a vivid neon blue color! Clean paraiba tourmalines with this vivid blue are exceptionally rare and highly collectible. Certified by GIA as natural tourmaline containing traces of copper and manganese ("called 'paraiba tourmaline' in the trade"). An exquisite gem tourmaline with rich and complex colors. This lovely pink gem displays orange and purple flashes as it turns in the light. Very clean and well cut, this fine tourmaline is a perfectly sized for an impressive ring. Guaranteed natural and untreated. A very fine chrysoberyl with unusual color saturation. Chrysoberyls are typically pale to pastel, but this 5.51 ct beauty is an intense yellowish green hue with outstanding brilliance. This is a lively and sparkly gem that will set up beautifully in your jewelry design. Guaranteed natural and untreated. A gorgeous large ametrine with superb transparency and well-defined color separation. This excellent material has been precision cut and perfectly polished to produce as fine an ametrine as you will see. Guaranteed natural and untreated. The finest Gem Silica comes from the Inspiration mine in Arizona. The best of this material is an intense turquoise color with very good translucency. This bright and vivid fancy cabochon is an excellent example, with a unique shape perfect for a stunning pendant. Guaranteed natural and untreated by AJS Gems, Bangkok. An outstanding mint garnet with wonderful saturation! This is an unusually vivid and brilliant stone and completely clean. Fashioned in an elegant cushion, this fine gem will make an impressive ring or pendant. Guaranteed natural and untreated. 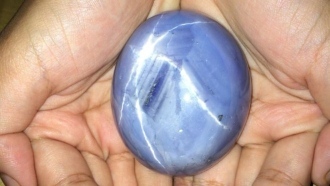 The BBC published a story on January 4th on a 1,404 ct blue star sapphire recently mined in Ratnapura in Sri Lanka. It is believed to be the largest blue star sapphire in the world. The story, by P. Sivaramakrishnan of the BBC Tamil service, stated that the gem is valued at $100 million and the current owner believes he can sell it for up to $175 million at auction. Just another reminder that, in the world of fine gems, quality is much more important than quantity. And don't believe everything you read, even on the BBC. You'll find that most of the finer gems in our collection have already been certified by leading labs such as Gemological Instittute of America (GIA) and GRS GemResearch Swisslab (GRS). You can view copies of the lab reports on our website on the detail pages for the relevant gems. We can also obtain lab reports for any gem that has not already been certified. For more information, please see our guide to gem certification.